12 Things I Should Probably Quit Doing – Who Dried My Jeans?! On April 12, 2015 August 7, 2015 By Who Dried My Jeans?! You know all those small, insignificant things that you do and plan to continue doing despite having the feeling that you should really stop? Things that really aren’t THAT bad and probably won’t kill you or your kids yet you can’t fully enjoy the experience because of that guilty voice? I’ve comprised a list of my top 12 things, in no particular order, that I should probably quit doing yet I have no plans to put them on my “things to quit doing” list at this time. Sunday nights at our house is popcorn night. My younger kids love to watch the little package of Kroger brand Movie Theater Butter microwave popcorn spin, then slowly unfold. With their noses inches from the door they relay to me what’s happening to their soon to be snack awakened by dangerous microwaves. “Mom it’s getting bigger! The pops are slowing! Can I push STOP? Huh mom? Can I push it? Mom, mom?” It is quite the event. I can’t deny that I don’t enjoy the temporary trance I received from watching a hard stick of cold butter turn round and round as it slowly caves in on itself. I try to tell myself that they wouldn’t have put a window in the door if it wasn’t safe for me or my children to look in, but “they” say it’s not safe, so I can’t fully enjoy the experience for my children or myself . 2. Eating raw cookie dough. One of my favorite parts of making cookies when I was a kid was eating the dough. This delicious childhood memory is now plagued with the fear of salmonella. I used to sneak and eat it, popping little bites in here and there, while making cookies with my little ones. They quickly caught on that it is fabulous, really even better than the cookies themselves. Fruits and vegetables can have salmonella on them and we push those down our children’s throats thinking rinsing them under cold water kills the bacteria. Nooooooo! “They” gave the bad rap to raw cookie dough! Well, we don’t make homemade cookies near enough so I feel our odds are low. Therefore, we all enjoy at least one cookie’s worth of dough and pray for the best. 3. Using bubble bath in my jetted tub. The man who installed our tub specifically said, “no bath salts or bubble bath in the tub”. I remember looking at him and thinking to myself, “are you kidding me”? Well sometimes you’re just tired. It’s nice to put a few squirts of bubble bath in the water, throw the kids in and start the jets. Following the wash cycle: 1. Drain the dirty water, 2. Turn on the shower for the rinse cycle, 3. Towel dry. Bath…Time…DONE! Not to mention the kids have a fabulous time and think you are awesome at least until teeth-brushing begins! Additionally, if you are skilled at pretending you are deaf and blind, you can get a few peaceful minutes to yourself to read a magazine while sitting on the toilet lid during the wash cycle. 4. Offering Sweet Frog as a reward for good behavior. I regularly run from one end of the house to the other insufficiently clothed. We have a neighborhood road that goes in front of our house as well as one in the back. We also have lots of windows in our house because I enjoy lots of natural light. We also have some new neighbors that I didn’t know had moved in yet. I do own robes but they are such a hassle, Gosh! Well, I know that I saw him and I’m quite that confident that he saw me because he quickly picked up his toddler and started heading home after looking my way. In addition to mastering the art of selective deafness, I have mastered the ability to pretend that my eyelids were shut during an unpleasant event completely erasing it from my visual mind. This will make it possible for me to talk to my neighbor on our back road while our children are riding bikes. Another time I was running from one end of the house to the other in just a towel. I looked up to see a man taking pictures of our house and possibly me in the background. I’m not sure if that helped or hurt our recent house appraisal. Did I forget to tell you the towel was on my head? 6. Using things that are not tissue to clean noses. I do my absolute best to make sure that I have tissues, wipes, and even paper towels on me or in my car at all times. I even carry a gallon jug of water in my truck in the event that I may need to give an unexpected roadside bath. It seems that more often than not however, my children decide to have an explosive, sinus cleansing sneeze when we are at the park and I only have my keys. Trust me, if you don’t know for yourself, leaves do a poor job and hurt. I’ve been tempted to use the bottom of their shirt but then know when they do it themselves I can’t ask them, ” just who taught you how to do such a disgusting thing”! I’ve had to pinch the snot from their nose with my bare hand and wipe it on the grass. Any residual slime left behind on your hands seems to disappear after you rub them together for a bit. If you’ve never done this, I haven’t either, it was just a made up story I told you. 7. Wearing clothes taken from the dirty laundry hamper. My son always seems to come out of his room dressed in clothes that I know he wore earlier in the week. Same thing with pajamas. He has several pair but he alternates between them like they are his bedtime uniform. I sometimes make him change and always regret it. It takes him twice as long to put on clothes that he doesn’t want to wear compared to the unusual amount of time it takes for him to put on clothes he does like. If Febreeze came up with a scent called, ” I swear I just washed it” I think it would sell like hotcakes, and if hotcakes didn’t sell, we wouldn’t have Pancake Suppers to raise money for our schools. I guarantee school buses all over the place would reek of the stuff in the mornings. 8. Taking an afternoon coffee break to calm down. Sometimes in the late afternoon, when the kids are home from school, I decide I want to take a little break before we start homework and running here and there for activities and making dinner. I love coffee and the thought of it makes me feel really nice, so I decide to have a cup. Every time, I repeat, every time I decide to do this it is not good. The caffeine usually kicks in mid math or right when I discover we are running late for dance class and all need to get shoes on and buckled into the car and her black leotard cannot be found. As many of you know from Warm Blooded Love my kids have their first furry friends. They aren’t dogs or cats but rodents…I mean hamsters. My son’s hamster is named Mickey and he loves him so much. They are best friends and have so much fun playing together. (I’m only speaking for my son right now). Anyway, he’s always wanting to kiss him! On the head or back, I don’t know. I don’t like any of it. I just try and pretend it doesn’t happen. If I told him not to I know he would sneak and kiss him when I wasn’t around anyway. It hasn’t been a problem lately however. My son has been grounded from playing with Mickey for the past several days for not playing nicely. 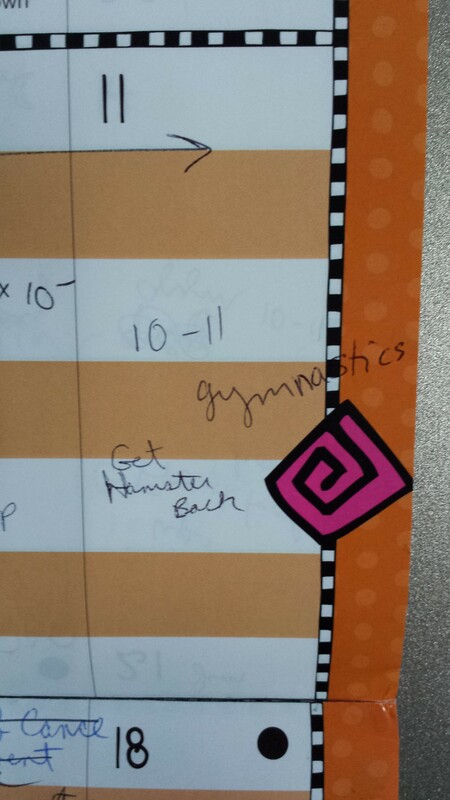 He gets him back on Saturday and yes I have to write things like this on my calendar or they try and trick me. I had been doing laundry earlier in the day and Harrison was letting Mickey walk around on the top of an overturned laundry basket. Thinking this was harmless, I turned around to my work in the kitchen. When the tone of my son’s laughter sounded mischievous, I turned around to further examine the cause. He had been depressing the center of the laundry basket in, then would wait for it to pop back into shape, throwing his furry friend into the air and would catch him precisely at the point where he stopped going up and before heading down!!! By the way, I promised myself that I would not Google: Do hamsters carry diseases?…but guess what? Small rodents and reptiles are big carriers of salmonella! So, with the rodent kissing and the cookie dough eating, our family is basically a ticking time bomb for a salmonella outbreak! 10. Eating my children’s Easter and Halloween candy when they are not at home. I don’t really feel like it is stealing. I’m quite sure they would say “yes” if I asked them and made them feel guilty. They really have way too much anyway and I’m just protecting their teeth. We all know that children don’t have the manual dexterity to thoroughly brush and floss to prevent cavities. Plus, if they filled up on candy their bellies would be full and they couldn’t eat their fruits and vegetables thoroughly rinsed with cold water of salmonella. 11. Expelling gas with my family. We all do it and most all know where and when it is appropriate, despite the occasional accident caused by sneezing, etc. There’s a time and place for everything and gas being expelled with your closest family is funny. Always was, always is, and always will be…but not at the dinner table . I will never get tired of hearing someone in my family say, “did someone step on a duck in here”? 12. Asking everyone I know, including those on the internet I’ve never met, for advice before listening to the Spirit of God inside of me. Sometimes I don’t ask or listen because I don’t want to hear, “wait”, “not now”, or “NO”. I then keep seeking and searching for advice from others until I find what my flesh wants to hear. I find advice but I find no peace. Other times, I know exactly what I’m supposed to do but I’m scared or lack faith to act. It is then easy for me to find advice that will further discourage and stop me in my tracks. I find advice but I find no peace. Sometimes, I know immediately when the advice I’m receiving is some I should take. It gives me chills because it sounds like it is coming from the same voice I hear from within me but too often tune out. I’ve made a mistake. This one needs to go on my “Wise Things to Work On” list. Pingback: Life Lessons | Who Dried My Jeans? !